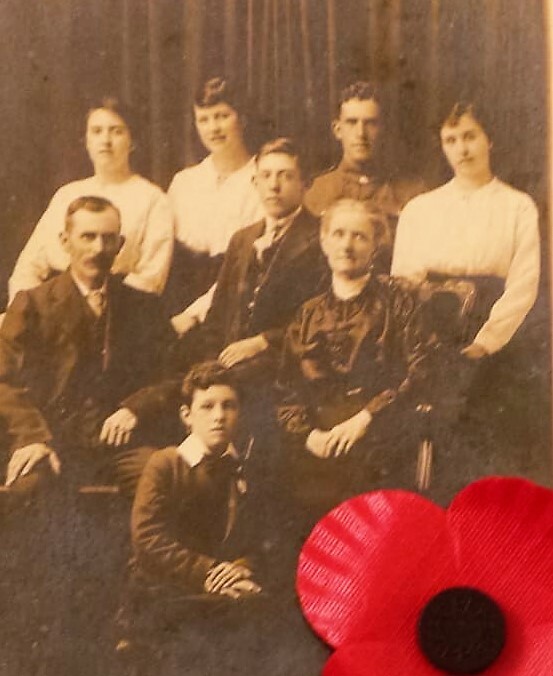 220168 Private William Alderson Moses, 7th Battalion, The East Yorkshire Regiment was killed in action 8 June 1918 and is buried in Hawthorn Ridge Cemetery Number 1, Auchonvillers, France. He was 21 years old and is commemorated on Evenwood and Etherley War Memorials. 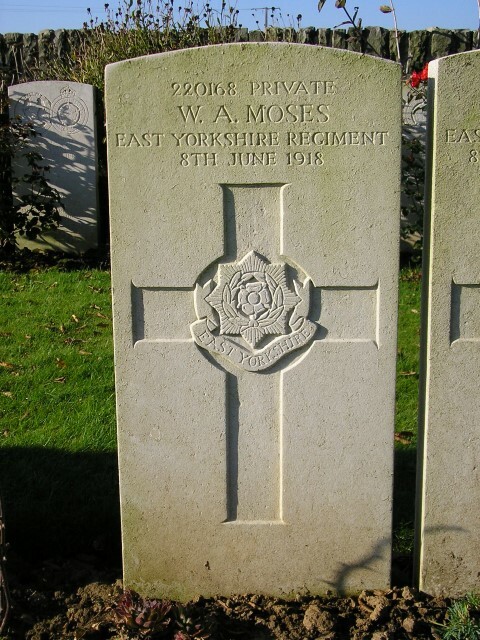 The service details of Private W. A. Moses have not been researched so the date he enlisted and transfer from the Yorkshire Regiment to the East Yorkshires is unknown however the Medal Roll indicates that he did not enter France until after 31st December 1915 since he was not awarded the 1914 or 1914-15 Star. Often called “the Kaiserschlacht” the offensive was Germany’s last big effort to win the war before the arrival of American troops. The U.S.A had declared war on Germany 6 April 1917 but it naturally took time to build up forces and prepare them for battle. The Russians had signed for peace with the Treaty of Brest-Litovsk in December 1917 so the Germans could now transfer their battle hardened troops from the Eastern Front to the Western Front and prepare to attack the Allied forces. The German plan, Operation Michael was to punch through the British and French Armies at St. Quentin, cut through the Somme and then wheel north-west to cut the British lines of communication behind the Artois fronts to bottle up the BEF in the narrow neck of Flanders. The British Army would be surrounded with no means of escape and would inevitable surrender. The target of the first phase of the offensive was the British Army who the German High Command believed to be exhausted by the four major efforts of 1917, namely Arras, Messines, Passchendaele and Cambrai. At the same time as the German forces were growing, the British Army was depleted having faced a manpower crisis during the second half of 1917. Lloyd George produced official figures to confirm that there were some 324,000 additional men on the Western Front (i.e. British and Dominion forces) giving a total of 1,850,967 on 1 January 1918 as opposed to 1,526,182 on 1 January 1917 but the effective fighting strength had fallen by as much as 7% in the year. The immense German attack of 21 March 1918 enjoyed a numerical superiority of 56 Divisions against 16. German superiority was overwhelming. 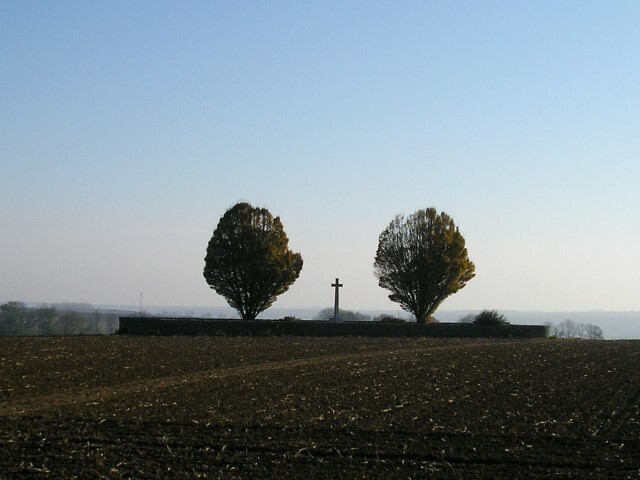 Along with the 2nd, 12th, 47th & 63rd Divisions, the 17th Division formed the V Corps, part of the Third Army which were involved in this action 24 and 25 March 1918, the First Battle of Bapaume which was part of the German Spring Offensive. The next significant action, in which the 17th Division was involved was in early August 1918, the Battle of Amiens. But, the Battle of the Aisne commenced 27 May and continued until 6 June, to the south of the front which the 17th Division occupied. It seems that the battalion was under constant attack, particularly during hours of darkness. Whilst the exact circumstances of the death of Private W.A. Moses are unknown it seems reasonable to assume that he was killed as a direct result of hostile enemy actions such as shell fire or machine-gun/rifle fire. Since Private W.A. Moses is buried near Auchenvillers, to the north of Fricourt with others from the 50th Brigade, it is assumed that either the Brigade held trenches here or there were hospital facilities in this area. Private W.A. Moses was awarded the British War and Victory medals. Both of whom served with 6/Dorsets and in the same Brigade as 7/EYR.